Whether you choose low-voltage incandescent rope lighting for your holiday display, outdoor landscaping, or vehicle/boat -- or our low-voltage LED rope light that affords an energy-efficient, longer-lasting, and brighter burn -- we have lots of colors to choose from. 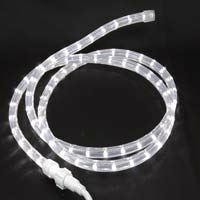 All 12V rope light is also sold in bulk reels or by the foot in custom kits to accommodate your specifications. The possibilities are endless for Christmas, year-round, and more functional illuminations because we stock all the accessories and mounting hardware for every application you may have in mind.